This is a client that I have been working with since 2004! This is their third house, having just moved to Burr Ridge, Illinois about 8 months ago. When I got their call, asking me to once again turn their new house into a home, we started with the dining room. 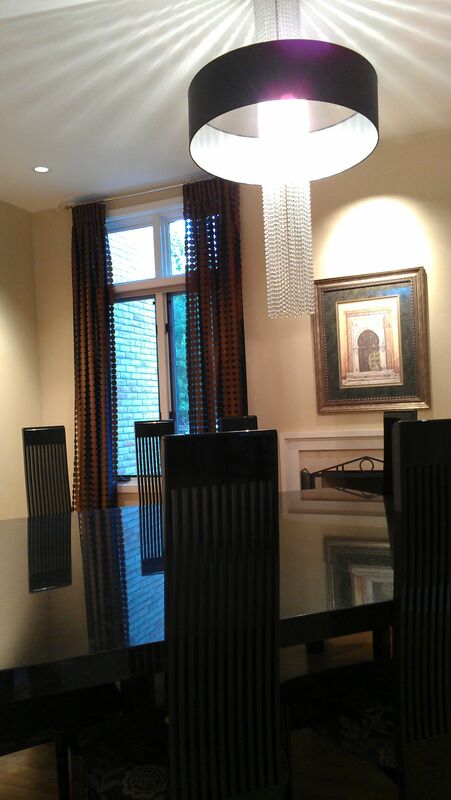 What grabbed my attention is the beautiful curved wall that separates the dining room and the breakfast nook area. That curved wall can be transformed into a sculpture! I contacted my faux artist and asked her to come up with textures for that wall to make it pop. The color scheme was inspired from the finishes in the room, such as the floors, the dining table top, and the fire place. The circle form was the geometric shape that was very apparent and repeated in the space to create a rhythm. Since the room has two large windows that bring in ample natural light, I thought we can afford having darker rich colors. The colors we chose were warm and powerful as well as appetizing: deep warm copper and commanding powerful black, accented by scrumptious kiwi green! 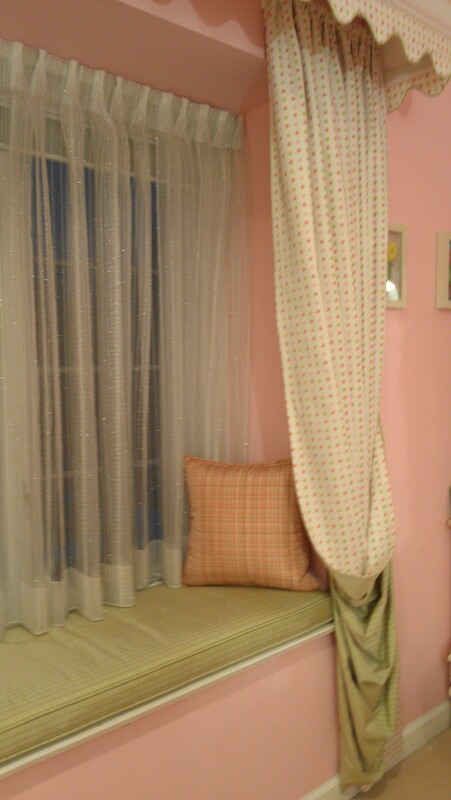 For the window treatment, a special fabric was selected to emphasize the circle shape. Larry Laslo fabric “Cufflink” color copper (from Robert Allen fabrics) was the face layer and it was lined with plain black sheer. The fabric “Cufflink” is made out of cut out circles which made it very special and unique. A special pleat was created to enhance the fabric and the overall modern design. As for the hardware, we used a plain stainless steel rod with clear white glass ball for the finials. 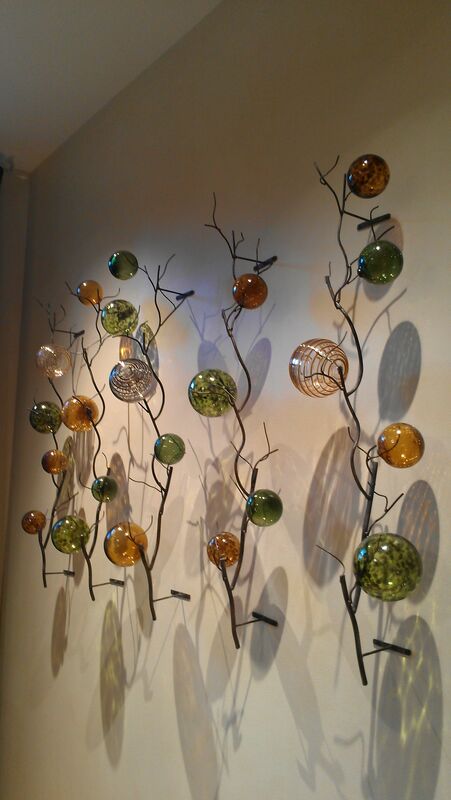 A wall sculpture made out of hand blown glass was a perfect accessory for the southern wall adjacent to the curved wall. The curved wall was textured in a heavy luster stone finish, with vertical lines, and in a soft coppery color with multiple greens, grays, and silvers. 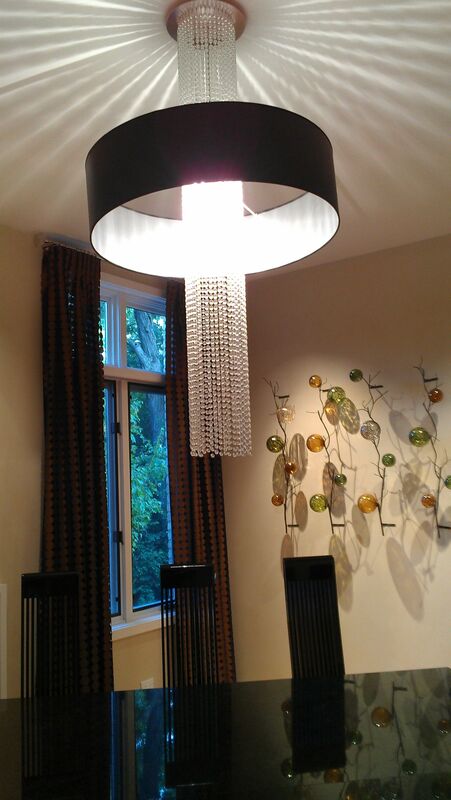 The heavy texture makes a great compliment to the delicate, transparent glass. 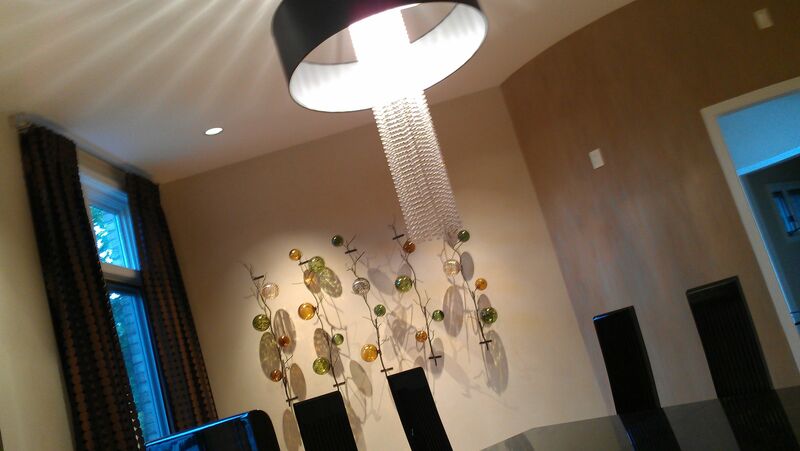 A special chandelier was selected for the center. It consisted of a large black drum shade lined in Matt silver with multiple rows of white crystal balls that creates a water fall effect! 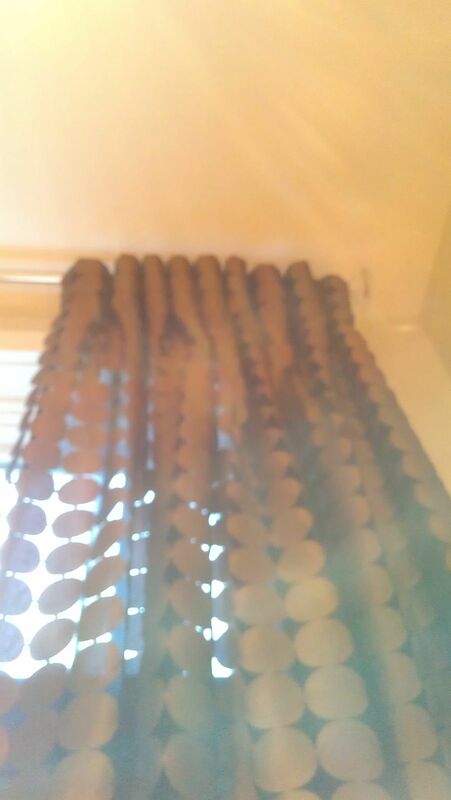 What is so stunning is that when it is lit, shadows of the crystals form on the inside of the shade that are the same size and shape of the circles in the window treatment fabric! 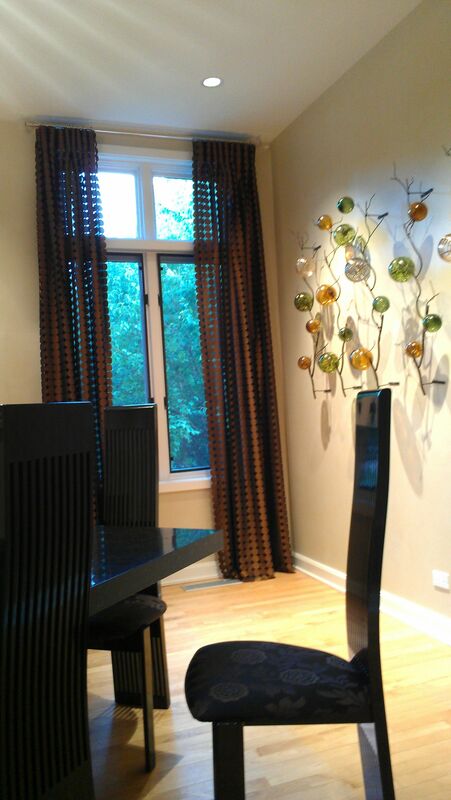 For the dining chairs, an upscale, Italian made chair was the client’s choice. The modern design, the reflective black lacquer finish, the high back with vertical lines and luscious black and copper upholstery fabric made this dining room a truly dynamic one! The colors are warm, rich, and bold. The circle shapes are selected to emphasize the curved wall and make it more apparent as well as creating a rhythm and enhancing the curves and the vertical lines were selected to support the beauty of the high ceiling and to create the sense of luxury, elegance, and extravagance! 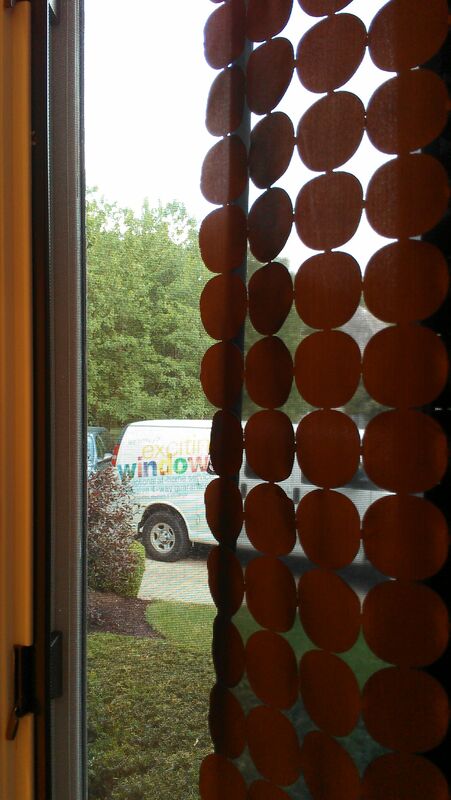 Have you had the chance to explore the possibilities of Allure window shades by Lafayette window fashions? 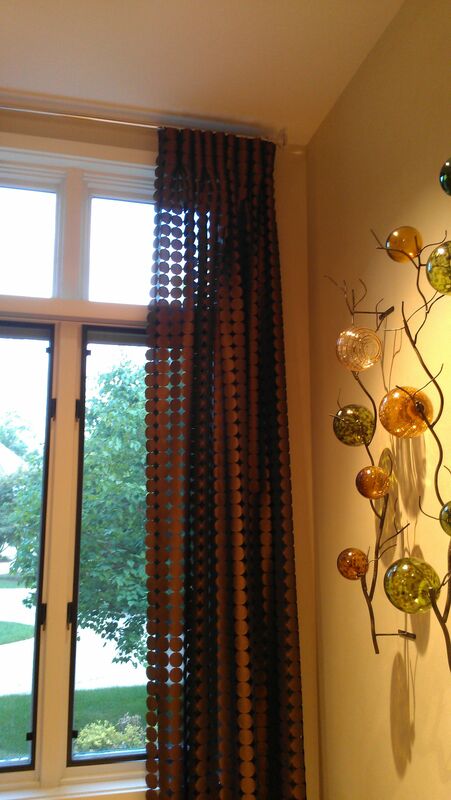 Allure is the combination of elegance and function in the world of window Designs! Call (630)420-0800 for a free estimate! 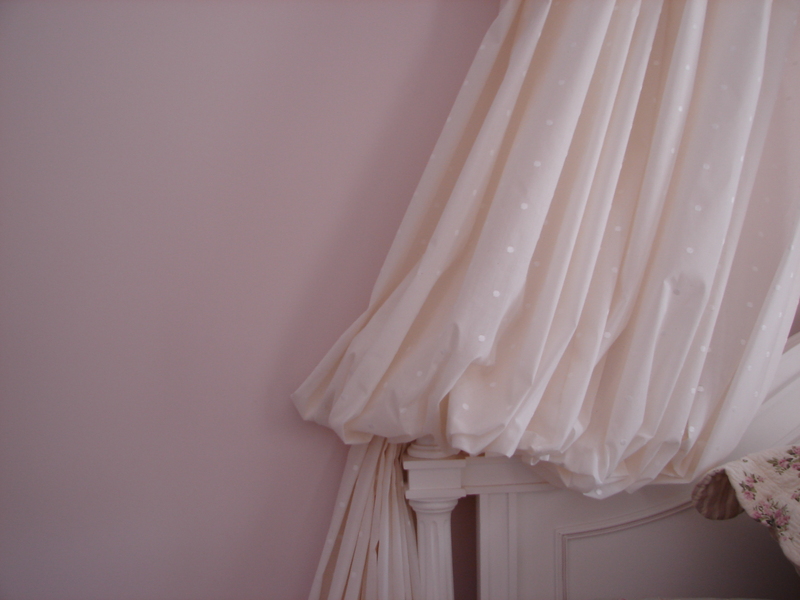 Style: Full drapery panels are in. 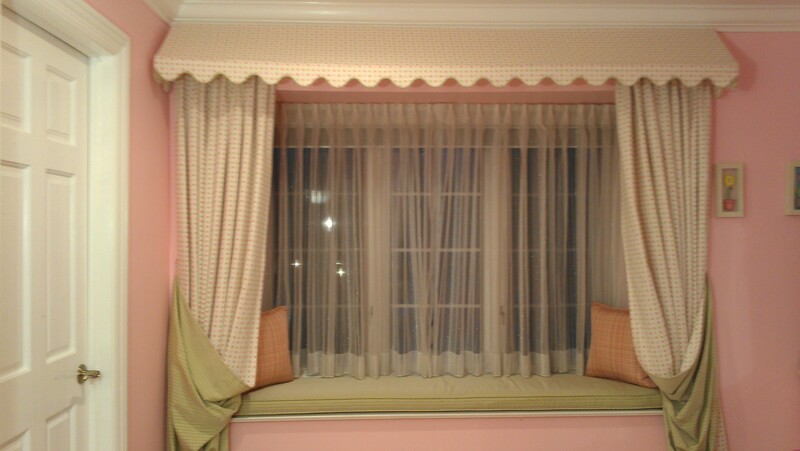 The past few years we saw more use of drapery panels on windows, with most unusual pleats and headings. 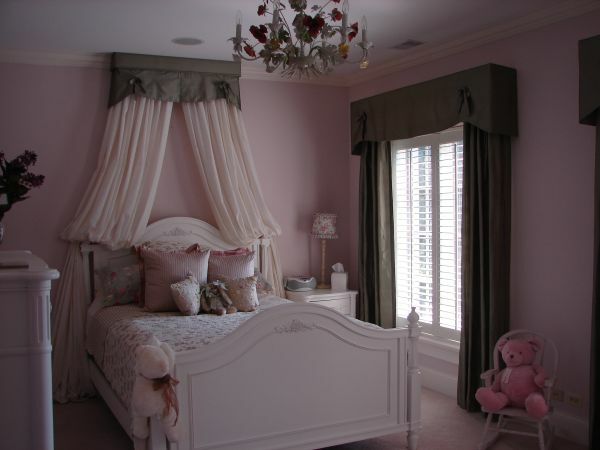 Roman shades in all known styles (flat, folded, ballooned, and all other types) are very much in fashion. 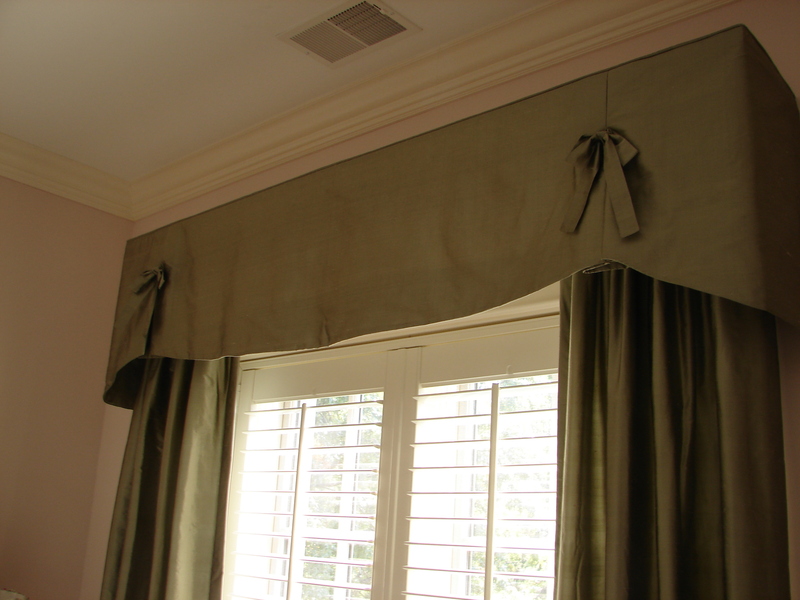 Roman shades are very popular because they are classic: when they are pulled up they create a valance to dress the window, they insulate when drawn down, especially when interlined, and provide privacy as well. Colors: With the down turn in the economy the past few years, we saw new trends for colors in general, and the window fashion industry is no exception. Bold, strong colors are back! They are used as a pop of color with a more neutral background. Bold Tangerines, Mangoes, Teals, Turquoise, and Reds with grayed browns are being used; these splashes of bold colors are a reminder to the world that there is hope and to look forward to a better future! Fabrics: Textural, embroidered and fabrics with natural fibers are in fashion. Fabrics like linen, cotton, Chenille, printed silks as well as natural silks are preferred over polyester and man-made fibers. Although natural fabrics are in demand now a days, synthetic fabrics are still finding their use in the design world. Clients also are asking for natural fibers, recycled, and (Green) products. Embellishments: Embellishing with bold, unique trims is very much in fashion. Using fringes along the vertical edges of a panel or having a plain panel with a one-of-a-kind over sized tie back tassel have become very popular. Having a breaded trim with a striking color in the perfect spot will accentuate an architectural feature that needs to be the focal point of a room. 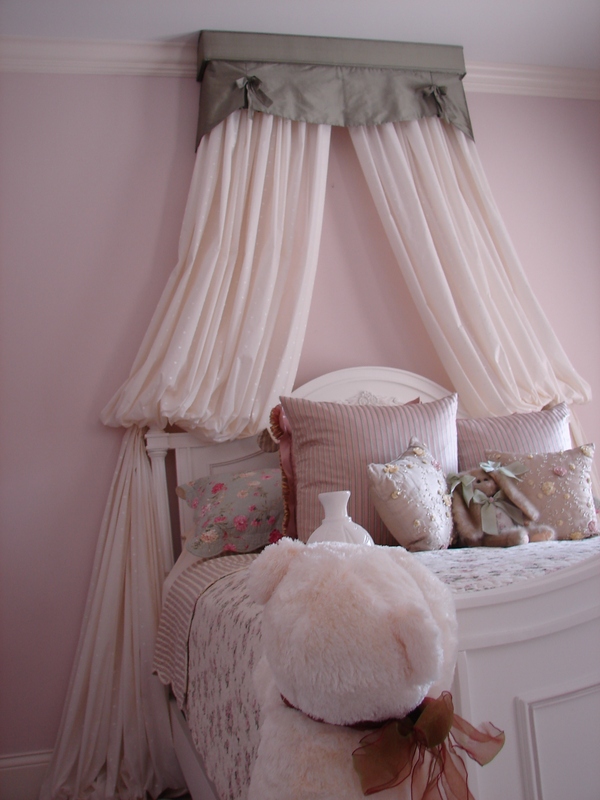 We are seeing more trims with wooden beads, mirrors, metal chains, feathers, and materials that are not usually used as a decorative trim. 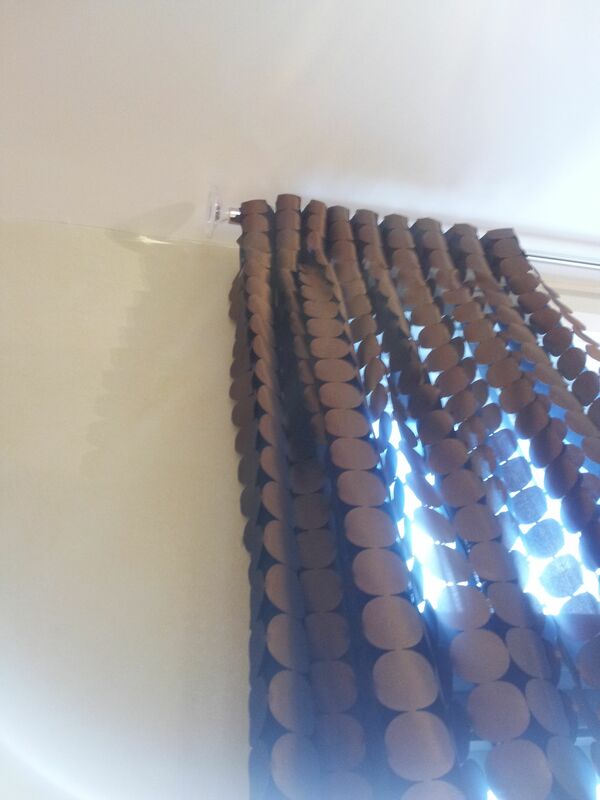 Pleating, buttons, grommets, and contrast cording is another way to embellish, and now more than ever, designers are using their creative juices to come up with ways to give their clientele head turning, knockout draperies that are totally their style. 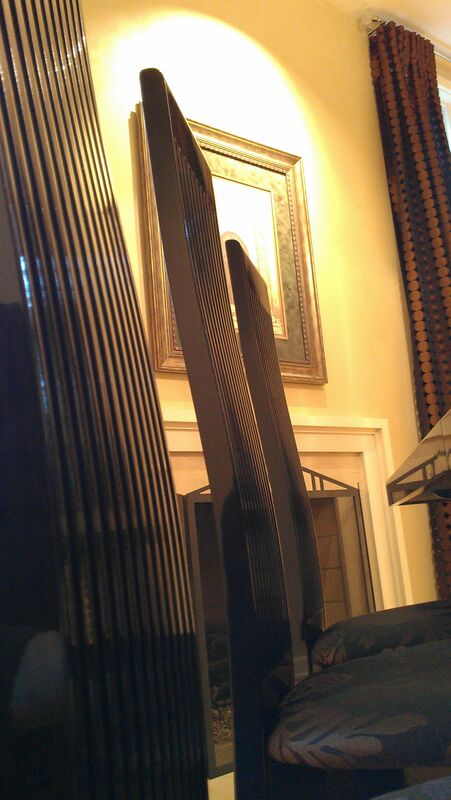 Utilize our free design consultation, and free phone consultation! Ask for Susan (630) 420-0800.